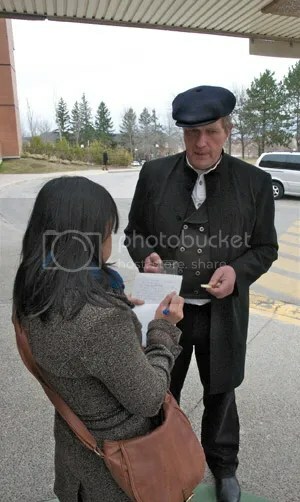 Michael Schmidt talks to a reporter during a recess in his 2011 court appearance, in Newmarket Ontario following which his landmark 2010 acquittal was overturned by Justice Tetley, on appeal from the province of Ontario. Today’s ruling upholds Justice Tetley’s decsision on the legality of raw milk. “A farmer who has spent two decades fighting for the right to sell unpasteurized milk to willing buyers pledged to take his case to the country’s highest court Tuesday after losing an appeal against his conviction for breaking public health laws. Speaking minutes after the Ontario Court of Appeal ruling, an unbowed Michael Schmidt said he would continue with his milk operation and legal battle. “Nothing really changes for me,” Schmidt told The Canadian Press. In its ruling, the Ontario Court of Appeal upheld a 2011 conviction against Schmidt that saw him fined $9,150 under provincial health-protection laws. 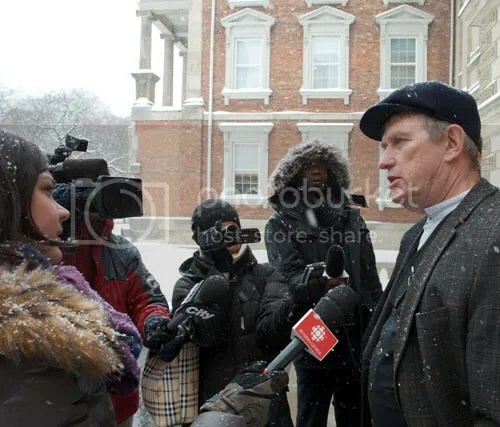 Raw milk farmer Michael Schmidt talks to a Radio Canada reporter last month during a break in the appeal hearing at Osgoode Hall in downtown Toronto. Today the judges announced their dismissal of Mr. Schmidt’s appeal, meaning that his 2011 conviction still stands. Tuesday March the 11th at 10.30 am the Ontario Court of Appeal will render the ruling of the three judges in the longstanding, long lasting raw milk case, which started 1994 here in Ontario. I have reported over the years on many statistics comparing the difference in death rates of various activities. The most striking one is smoking, which on the one hand creates an enormous amount of tax revenue but on the other hand also burdens health care dramatically. OTTAWA – The Green Party of Canada is concerned that Bill C-18, the Agricultural Growth Act, which was debated for the first time on Monday, will actually restrict farmer’s ability to grow crops in Canada. By forcing a stricter regime of intellectual property into the growing process in the form of Plant Breeders’ Rights, this bill will restrict the ability of farmers to engage in the age-old practices of saving, storing, cleaning, and treating their own seed. Precedent-setting win for Mark Baker and his “feral” pigs in Michigan? “The state of Michigan angrily gave in to farmer Mark Baker, telling a state judge that the farmer can continue to raise his hybrid pigs clearly forbidden by the state’s contentious Invasive Species Order. What’s unclear is how the state’s move affects other farmers.